Sometimes you buy something and the moment you leave the store you're hit with that horrible feeling of buyers remorse. I can safely say that when I bought this Lightbox from Typo, I did not experience that at all. In fact, the words above accurately describe how I feel about my new light box. So far it has come in super handy as a blog/photo prop, fun personalised welcome sign for when people have come to stay with us, and just general display of silly words and messages. An A3 sized version recently appeared on the Typo website, and although I am tempted, I am strongly resisting the urge. Seriously, I would have nowhere to put it. Let me know what would you use the lightbox for? Guess what arrived in the post today?... My business cards from Moo.com! 2) Everyone else seems to have them. There's been a few awkward moments when someone has extended a business card to me and I haven't had one to give back. Those moments will now be a thing of the past. I had been meaning to order these for a while now, and when a free shipping code landed in my inbox, I thought - BINGO! I opted for one of the existing Moo designs as the last time I ordered stickers from Moo using my own design, I got the sizing all wrong and they came out a little fuzzy. Oops. So I thought it would be best to play it safe this time round and figured the 'Hello' theme tied in with my Hello Jesso blog. Anyway, that's all I wanted to share. It's always nice when you get something fun in the mail. Let me know if you have any great networking tips in the comments below. Ok, technically I've been back from Seoul for a week now, but I just wanted to share some of my Seoul adventures with you. If you want to know about the travel aspect of the trip: who we flew with and where we stayed etc. you're in luck. You can read all about it on my travel blog where I've done a whole post on - Where I Stayed - Seoul. It's up and running now. Finally. After signing up way back in March, I've finally managed to put some items in it for sale. It's only two items, so the store still looks kinda bare, but don't worry I am on the case! Pop back to My Etsy every now and again to see what's new. Just in case you were interested I have started a separate blog for all my Goccoing hi-jinx and other arts and crafts related stuff. I am slightly obsessed with my Gocco, and so last night I decided to play with it some more. After my simple first attempt and test prints , I thought I'd try something a little more girly and detailed this time. They are not perfect, but all in all I am quite pleased with them. I had a few issues with the ink blotting at the edges of the card, but oh well. It's all trial an error, and a learning curve. As they say practice makes perfect. Need to get more bulbs and screens. Did I mention the rather scary warning that features on the side of the bulb packet?... Something about the bulbs containing chemicals that may cause cancer, reproductive harm and birth defects. Eeeek! That can't be good at all. 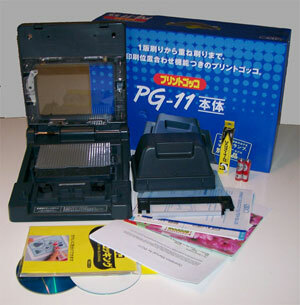 The severe lack of posting has been due to the fact that I am obsessed with my Gocco PG-11 printer. Shopping for clothes and other stuff has now been replaced by wanting and craving Gocco accessories and ink. I want it all! Anyhoo... just to show you I haven't been sitting on my laurels here is my handy work. 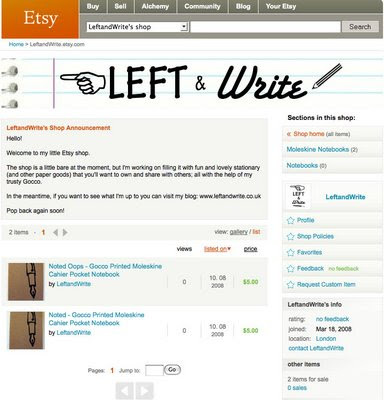 As you can see, I only did one design - a fountain pen - as my tester. As it turned out quite well (I think), my mind is now brimming with ideas. Have a look at all the other Gocco-ers out there and their wonderful creations. I'm off to Gocco some more.